High pressure that moved in from southeastern Canada in the last 24 hours brought us the coldest day we’ve seen in New England since December 8. The temperature was 10 below zero in Island Pond, Vermont to start the day, and the high temperature in Boston was only in the mid-30s. Believe it or not, this is one of the coldest days of December. Cold high pressure kept us dry Thursday evening, but then a mix of snow, ice, and rain will advance rapidly after midnight. We wake up to a plethora of different kinds of precipitation for our Friday. Along and north of the Massachusetts Turnpike, we start at freezing with snow turning quickly to freezing rain. Icy roads will last for a few hours toward the Vermont and New Hampshire borders. In Vermont, snow will change quickly to freezing rain and rain by 8 a.m., after about 1-to-2-inches of accumulation. In New Hampshire, the cold air will hang on through mid-morning, with 2 inches of snow in the higher elevations coated with ice at the lower elevations. In most of the state of Maine, we will stay freezing through lunchtime, with several inches of snow, coated with ice, through the early afternoon. The exception is along the Maine coast, where the temperature should get into the mid-30s by mid-morning. By afternoon, most of western and southern New England is raining with the temperature in the 40s. But the wintry mix continues in northern New Hampshire and central to northern Maine. In southern New England, the wind will increase from the south gusting past 30 mph. Along the south coast, we may see an inch of rain. Otherwise, rainfall amounts of less than 1/2 of an inch are expected. Rain tapers to fog and drizzle for most of us by sunset, leaving a rather pleasant Friday night, with mostly dry and mild weather. Low pressure to our north will send a sharp cold front across New England Saturday. The first impact will be snow squalls in northern Vermont, and then just a gusty cloud going by southern New England midday and afternoon. Ahead of the front for many in southern and eastern New England will have nice weather with a mix of sun and clouds, high temperatures near 50 degrees. 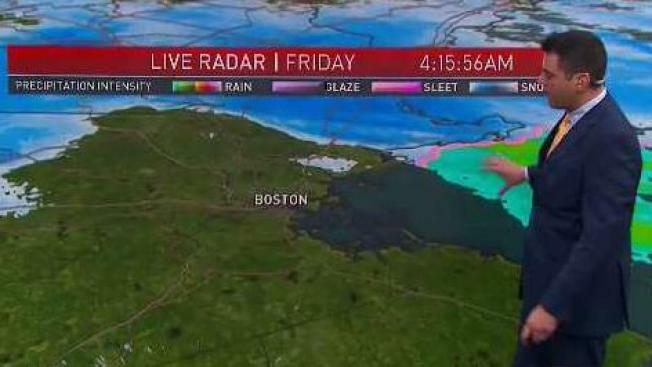 Western New England turns blustery with a temperature following dramatically before sunset. It is a wintry cold wind Saturday night with that mostly clear sky, low temperature in the single numbers north to teens and 20s south. Sunday is a pretty wintry day with sunshine and a high temperature in the 20s north and 30s south and lighter winds. Monday starts off dry, but clouds and a wintry mix will be here by sunset. New Year’s Eve looks messy, with a cold rain for southern New England and a mixture of snow, sleet, freezing rain in northern New England. At midnight in Boston, it is probably about 40 degrees and raining. After that, we have a rather mild Tuesday before we turn colder mid-week, with a chance of more rain or snow later next week.